A significant share of travel activities historically has been booked offline and in-destination. But advance bookings are increasing as more activities become discoverable and bookable online, making pre-booking easier. In addition, many pre-trip activity bookers simply like having everything planned before they leave for their trip. The top reason activities were booked before arriving in destination was because the traveler wanted to book all activities in advance. Ticketed events and sport and cultural activities drive more pre-trip bookings because they typically are associated with limited capacity and preferred time slots. Important "trip-driver" activities are most likely to be purchased before flight or hotels are booked; 37% who attended a sporting event and 32% who visited an amusement or theme park purchased the activity before transportation or lodging. However, there remains a portion of the active traveler population who still prefers to book travel activities in-destination, and these travelers often wait until the last minute. Across most activity categories, more than three in four activities booked in-destination happened on the day of or day before the activity. 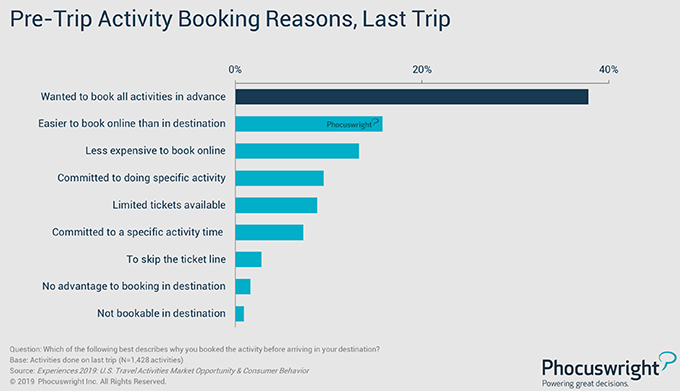 The reasons that activities are booked last minute can vary by activity type, but the top reason across activity types is simply because the traveler is not a planner. Overall, travelers were most likely to indicate they didn't book ahead because they didn't plan in advance or think about it. Attractions like amusement parks and zoos were more likely to be booked last-minute because travelers felt it was easier to book in-destination, whereas museum and performing art events were most commonly booked in-destination because travelers didn't want to commit to a specific time. Copyright 2019 Northstar Travel Media LLC. All rights reserved. From https://www.phocuswright.com.